If Uttam Kumar was her crush in the 1960s then my grandmother’s twenty-first-century crush was undoubtedly Aamir Khan. When I told her I had bagged a role in Rang De Basanti she said she wanted to come to the set to meet Aamir. We shot in Mumbai, Delhi, Jaipur and Punjab but sadly she was unable to come to any of the locations. However, in January 2006, when we were in Kolkata for film promotions, I asked Aamir if I could invite my grandmother to his hotel room to say hello. He kindly agreed. Lal Didi arrived beautifully turned out in a green silk sari the colour of bottled glass, her hair elegantly swept back into a neat bun at the nape of her neck. Aamir sat her down in a comfortable chair and asked her if she would like some tea or a fresh juice of some kind. Pat came the reply: ‘Teacher’s, no ice.’ I bit back a smile at Aamir’s look of surprise. It was 4 p.m. If Lal Didi was liberal and independent in spirit, my Amman is much the same. At seventeen she was already living and working in Bombay. She was the first Indian actress to model a bikini on a magazine cover. At twenty-four, when her career was at its peak, she chose to commit what many called professional hara-kiri, and got married—to a Muslim prince at that, at a time when inter-religious marriages were uncommon. She continued to work after marriage and well into motherhood; my brother was born two years after her marriage. In fact my childhood memories are of Abba being at home and Amman going to work – she would get us to wish her ‘10 on 10’ as she was leaving. I am the youngest of three. By the time I was born Amman was not working as much as she must have been when Bhai was young. I remember her being an active member of the school PTA, participating in bake sales and charity fundraisers. She would drop my sister and me off to school every morning until we reached that age when we are embarrassed by our parents and prefer them to stay a mile away from us in public. There was even a time when she had chickenpox – which she got from me because I refused to stay away from her during the contagious phase – and I still insisted she come to school to drop me. Which she did, wrapped from head to toe in muslin and swooning from the fear of being discovered to be an irresponsible parent, exposing the children to pestilence. But apart from this one lapse of judgement, Amman continues to be the wisest and most sensible person I know. I have sought her advice on multiple occasions because I know she will not merely say what I want to hear but what I need to hear. From choice of boyfriend or college, to length of skirt and shape of eyebrow, I have always known where my mother stands. She is not exactly subtle with her opinions. Although not easy to digest, especially as a rebellious teenager, it would annoy me no end that ultimately she had the uncanny ability to always be right. I think I’ve established by now that I have properly famous parents, and grandparents, and great-great-great-grand-uncles. My brother Saif, who I call Bhai, is also a famous movie star and he is married to Kareena Kapoor, one of Bollywood’s most popular and successful actresses. Their son Taimur was trending on Twitter before he had even opened his eyes. Has all this celebrity had any impact on my life? I went to the same college as my father and saw his name in brass in the locker room of the Oxford University Parks Cricket Ground, right next to my grandfather’s. I joined the same industry as my mother and brother and have fought hard to carve my own identity within it. I am surrounded by my family’s achievements. I am immensely proud of my heritage; I feel special to belong to this family that has so much history, so much talent and virtuosity running through its generations. I have benefited from my family connections—they have opened doors and facilitated introductions, provided me with a security and respect that I would otherwise have spent many years earning, given me recognition which brings a power that is not insignificant and afforded me financial security (that I try to keep at arm’s length—like the boy you know you can depend on to take you to the ball when all else fails, but really you want Timothy to ask you. Timothy in this case is my own hard-earned money). I remember going out for lunch with my family in Delhi as a child. Bhai had recently started working in films and his song ‘Ole Ole’ from Yeh Dillagi had become a big hit. Throughout the meal people kept coming to our table to ask for autographs – from my father, my mother and my brother. My sister and I could continue to eat our food undisturbed, which we rather enjoyed, feeling bad for the other three. I don’t recall ever wanting to be as famous as them, wanting to sign autographs or having my hand shaken. I saw so much of it growing up that it didn’t seem to retain much lustre. I suspect the same is true of my sister, Saba. She has always been more comfortable behind the camera, taking beautiful pictures, than in front of it. Being of an artistic inclination, she chose to get her undergraduate degree from Delhi College of Arts, and then went to the Gemological Institute of America in Carlsbad, California, to study jewellery designing. I chose to be a film actor, not for the fame or the money – I don’t mean to sound arrogant when I say I had need of neither – but for the job, the creative fulfillment I get from walking in the shoes of another person. It was not, as many people assume, the easy choice to be an actor. In fact it was one of the most difficult decisions I have ever made. Since my first film in 2004 I have tried to carve out my own path, forge my own identity. I have achieved a level of success and fame that I can comfortably call my own, but that level is moderate in comparison to the accomplishments of my various family members. And therein lie the perils. Perils which, if you were made of flimsier stuff, would nibble away at you and leave you feeling less than whole. 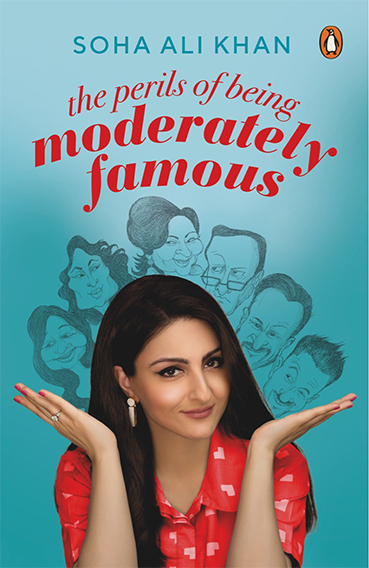 The Perils Of Being Moderately Famous is set to release later this month. Excerpt published with permissions from Penguin Random House India. Watch out for an interview with the actress about her legacy and the joys of writing.